. . . but the best time to see them is at night. My wife and I were driving along Wilshire Blvd a few months back when I stopped and snapped off a couple quick pics. Wish I had some more time - and a tripod. 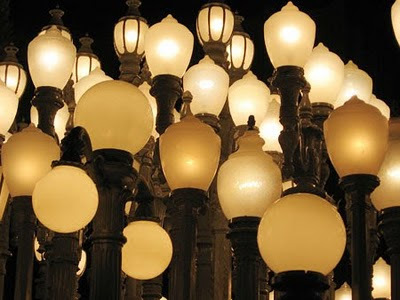 Here's a link to another site with some better pics of "Urban Light" http://artandperception.com/2008/02/urban-light-chris-burden-bcam-lacma.html. My hats off to the photographer. As we move into the Christmas season, it's a reminder for me to be perhaps less concerned about the twinkling lights around the house, more concerned with my character, my actions, and my involvement in those who Jesus described as "the least of these." Great blog - keep up the good work. Cool pictures. I was just looking for pictures of lightposts in Beverly Hills and I found a believer making interesting commentary and making sure to not hide His light under a basket. 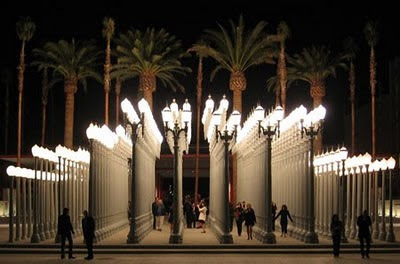 Nice post about LACMA. Their light is very beautiful . Led lights are always great to watch. Nice collection of pictures of Los Angeles County Museum. 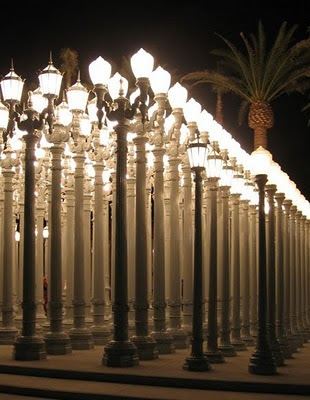 I visited LACMA last year. Really, their lighting is eye catching!